While the snow continues to pile up on the streets and sidewalks and the long and hungry month of March approaches, beat the winter blues by taking a minute away from the day-to-day to find a little humor in the Dictionary of Newfoundland English. Last year, DNE editor Dr. Kirwin suggested that there were various nicknames in the DNE that might be of interest for a blog entry. Upon investigation, a number of entries appear and many of them are quite amusing. Nicknames can place a person regionally, socially, physically and so on. 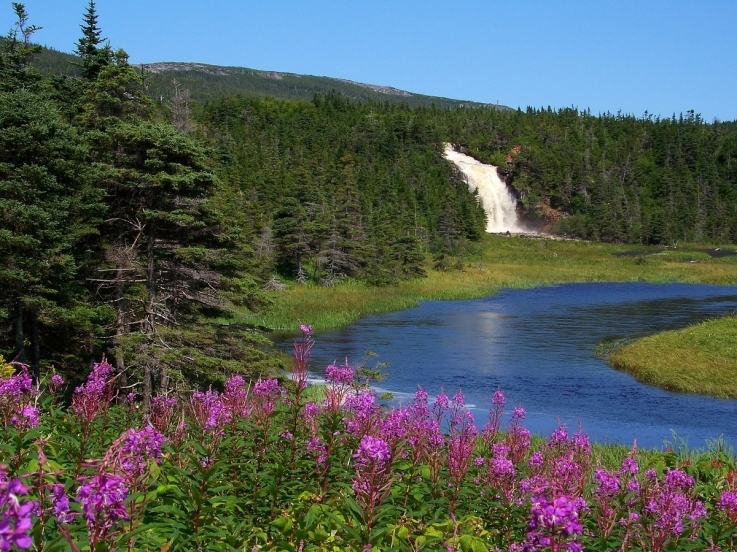 If you know of Newfoundland and Labrador nicknames that you would like to share, please do so! You can click on the hyperlinked text below to take you to the DNE entry. 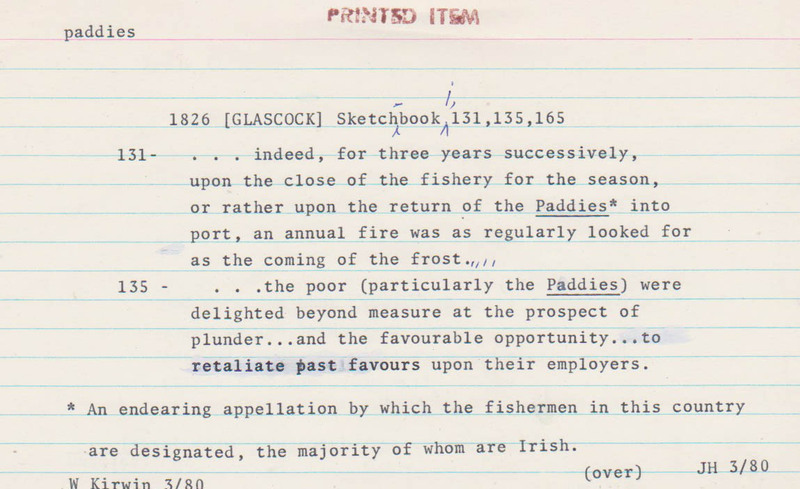 Many of you will be familiar with the name patrick or paddy applied to any Irishman, but here in Newfoundland the term was more tightly constrained and applied mostly to fisherman, especially an Irish fisheries servant. Word-file for ‘patrick’. Reproduced by permission of the English Language Research Centre, Memorial University, St. John’s, NL. Most of the nicknames for people from different communities around the province come from Newfoundland fauna, mainly birds. If you hail from Bay Bulls, perhaps you’ve been called a bottle-nose, meaning puffin, or you’ve used the term gammy birds (American common eider) to refer to your Witless Bay neighbours. 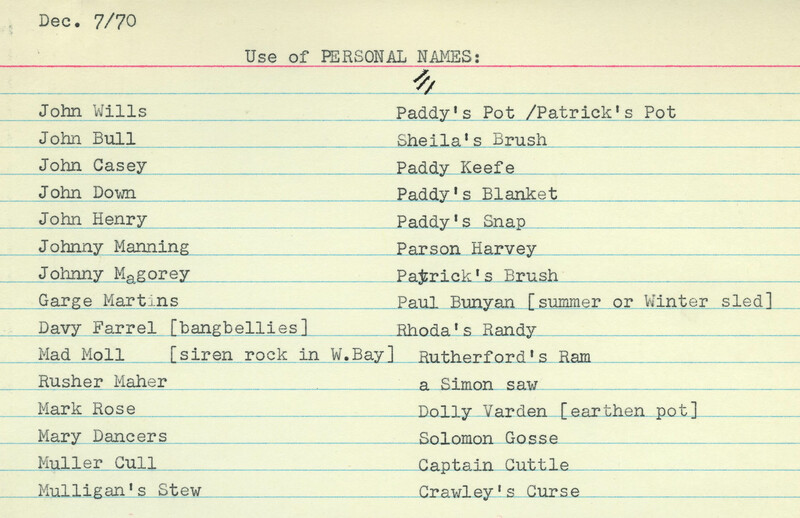 There is one citation from 1964 in the DNE research collection stating that Ramea residents have the nickname puffin. ‘Bottle’ word-file from 1964. Reproduced by permission of the English Language Research Centre, Memorial University, St. John’s, NL. No doubt you’ve heard the insult “You old crow”, but crow can also be applied to those from any nearby community. The St. John’s townies might use the term to talk about those from Mount Pearl, for example. The DNE has citations that refer to the Garnish and Scilly crows. Goat is applied in a similar way. The DNE has citations for the Upper Gullies, Fortune, and Mobile goats but also has billy goat and nanny goat in reference to those from the Southside in St. John’s. Those from Fortune have also been called gallies. The English Dialect Dictionary (EDD) contains gally-bagger meaning scare-crow with evidence from Devon, Dorset, Isle of Wight, Somerset, Wiltshire and Hampshire. Word-file for ‘gally’ from 1966. Reproduced by permission of the English Language Research Centre, Memorial University, St. John’s, NL. Grand Bank residents have the moniker shags (Phalacro-coracidae). The term shag is also common in Newfoundland place names. If you’re from Placentia Bay, you may have been called a hagdown before. Hagdown is the Newfoundland term for both the greater shearwater (Puffinus gravis) and sooty shear-water (P. griseus). Residents from Herring Neck applied the nickname slowcome to those who lived across the bight. As the word-file below illustrates, there would typically be a tussle when the slowcomes ventured across the bight. Word-file for ‘slowcome’ from an interview recorded by DNE editor J.D.A. Widdowson in 1965. Reproduced by permission of the English Language Research Centre, Memorial University, St. John’s, NL. When meeting people for the first time, there are often things that stand out in their physical appearance. Coppertop is the physical trait that many associate with the term ginger in today’s world. 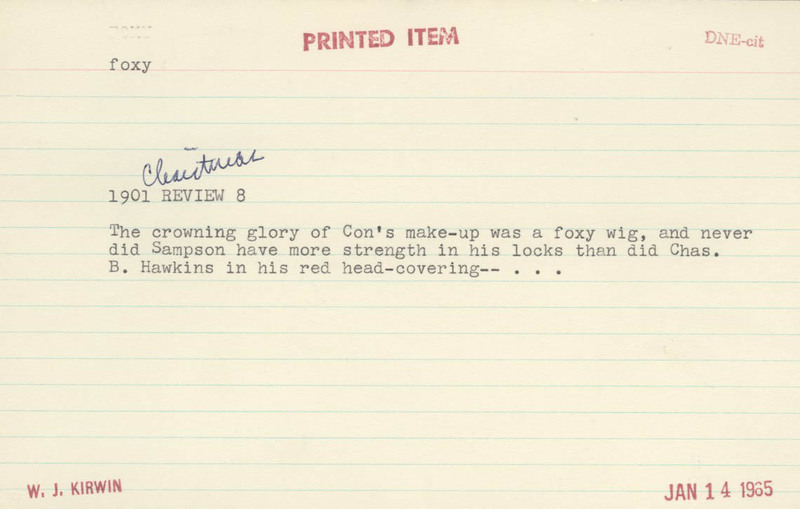 A person with red hair could also be called foxy. The EDD contains brindy for a red-headed person. Those who are left-handed may have heard the local term skit which comes from the Irish schiteach, literally translated as left-handed. ‘Foxy’ word-file. Reproduced by permission of the English Language Research Centre, Memorial University, St. John’s, NL. There have been a few times in the past several years where I’ve come across words in the DNE and was surprised that they had a special Newfoundland sense. Tattle-tongue is one of these words. This is a nickname for a child who tattles on others. Tattle-tale is the term cited in other international dictionaries. 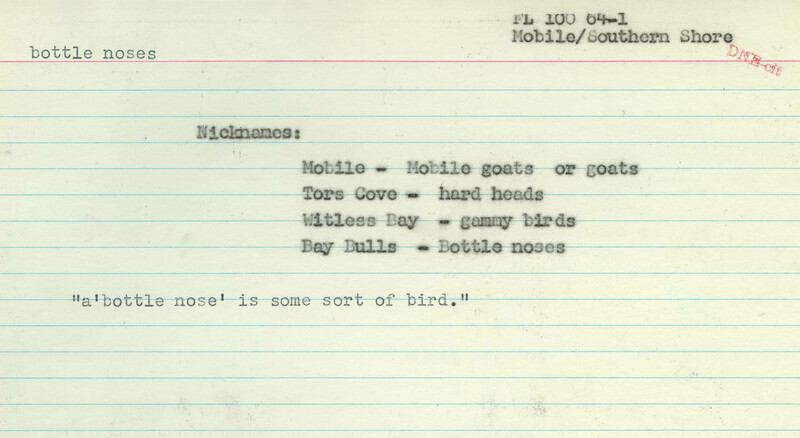 Word-file for ‘tattletongue’ from 1979. Reproduced by permission of the English Language Research Centre, Memorial University, St. John’s, NL. If you’re aboard a ship, you had best hope that you don’t be labeled the jinker, or the person who brings bad luck to the ship. 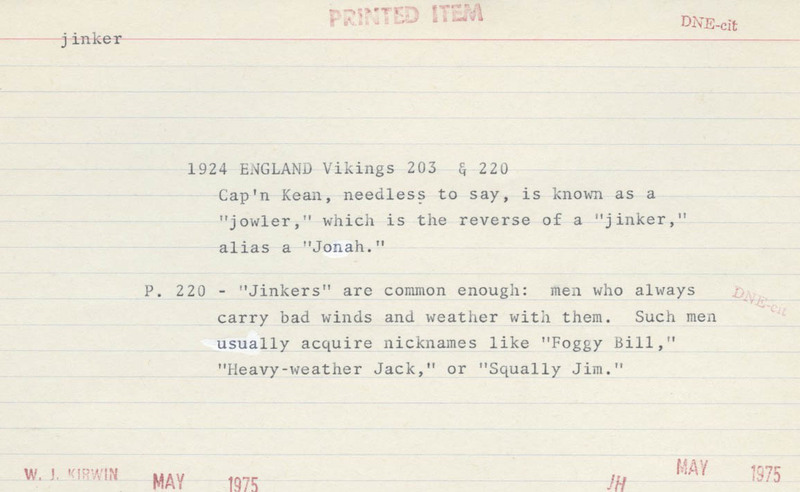 If there is bad luck while at sea, it was common to pick out a jinker through some noticeable trait, like having red hair, and pin the label to that person until the voyage was over. This unfortunate soul would have all manner of tricks played on him. Word-file for ‘jinker’. Reproduced by permission of the English Language Research Centre, Memorial University, St. John’s, NL. Inanimate objects also have nicknames, like a kettle which, according to the English Dialect Dictionary, can be more affectionately known as betty or a three-quarter barrel, known as betty murphy in Birchy Cove in the 1960s. Snow has the undesirable nicknames dung-mixen, devil’s feathers, and devil’s blanket used by the older generations in Seal Cove in the 1960s. The use of personal names as nicknames is a common enough practice. The word-file below gives some examples from Newfoundland. Word-file for the use of personal names as nicknames. Reproduced by permission of the English Language Research Centre, Memorial University, St. John’s, NL. For anyone from Newfoundland, the most well-known nickname for an inanimate object is the rock, which refers to the island of Newfoundland but can also be used to refer to Bell Island. Citations from the DNE research collection most frequently contain the old rock and go back to 1901. Interestingly, this term was only included in the DNE supplement. For those from the rock, this nickname may carry both pleasant and unpleasant connotations and there is some controversy surrounding the use of the term as seen in the word-file below. Word-file for ‘rock’. Reproduced by permission of the English Language Research Centre, Memorial University, St. John’s, NL. The English Language Research Centre has its own nickname too. It has been known for decades as the Dictionary Room. Please drop us a line if you have any nicknames to share! This entry was posted in Uncategorized and tagged Blogs, Dictionary of Newfoundland English, elrc, humor, labrador, local, Newfoundland, Newfoundland dialect, Newfoundland words, nicknames, Weather, winter, words. Bookmark the permalink. No problem Scott! Glad you enjoyed it.